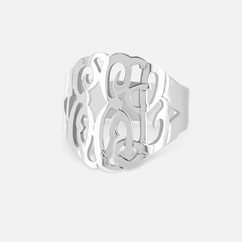 When it comes to fine monogrammed and name jewelry, MonogramOnline.com is in the top of its class. From silver and gold necklaces shaped into first names to cufflinks etched with initials. But that's not all the gift-focused website is about - its huge selection of monogram-ready wares include, but are not limited to, iPhone cases, kitchenware, to sporting goods. There is something for everyone! Check out this gorgeous 16inch Traditional Silver Monogram Necklace that I received from MonogramOnline.com! I am extremely satisfied with the outcome of my family's initials. The necklace is well made, very attractive, it's stunning, dainty, and I get many compliments every time I wear it. 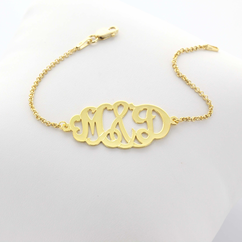 This monogram necklace would make a wonderful gift for a family member who shares some of your initials or a gift for yourself. Hey, Valentine's day is approaching! So why not buy the perfect personalized Valentine's Day Gift for someone special? They are pretty exquisite and can be personalized with any three initials of your choice. 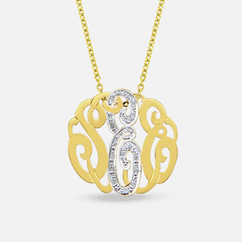 With monogram jewelry becoming a huge hit everywhere, there is no better way to accessorize your outfit than with initial monogram necklace from MonogramOnline. For more details or would like to order, you should visit their website today! Don't forget to like them on Facebook or follow them on Twitter for updates and promotions. So what are you waiting for? Please grab this offer: 45% off store wide - use code BLOG45. Disclosure: Product mentioned above was provided for FREE by MonogramOnline through US Family Guide for product endorsement/review purposes. I am disclosing this post in accordance with the FTC guidelines concerning the Use of Endorsements and Testimonials in Advertising. That is a really cool looking necklace. I really like it. These necklaces looks so beautiful. Monogram Jewelry has become the latest trend everywhere & I am sure MonogramOnline will play a major role in people finding the best they want. Thanks for sharing. I've seen this necklace at quite a few places lately. I have been seeing these everywhere but this is the prettiest one I've seen! I keep meaning to buy one but I never get around to it! How beautiful! would make a nice gift for Valentines Day! Thanks for sharing! That's really cute. I like the style of the monograms. Those necklaces are so pretty. I have been wanting to get one for those for my daughter. I love the monogram design. It's quite intricate and very attractive. They'd make perfect gifts.